It looks like we are back in the 1980's again. There is enough 'big hair' in this game to fill the places of a few hundred rock bands. It was an age of mighty giants, and some rather important short people (Peter the Great was 6' 8", and Louis XIV was 5'4"; it is amazing what heels and a tall wig will do). 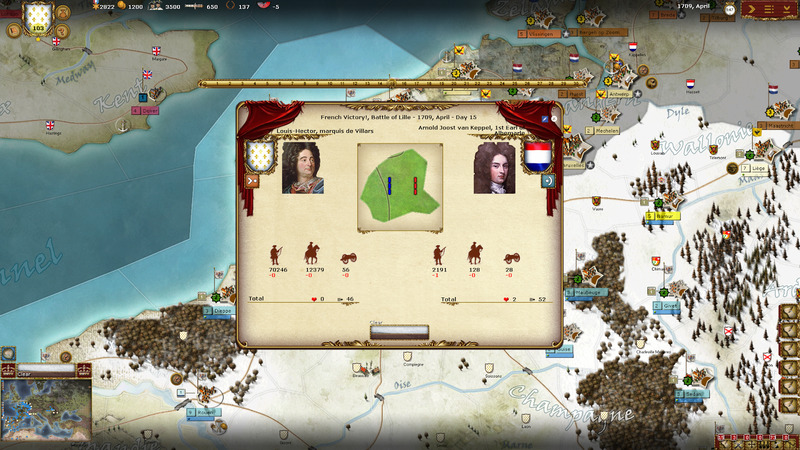 This game has it all for military history nuts: Marlborough, known as 'Corporal John', and the 'last Viking', Charles XII. Charles XII being one of the few to push back against the coiffures of the day. Battles from this time resound through the centuries. Poltava and Malplaquet, to name two among the many others. Well, enough of the history. What about the game? 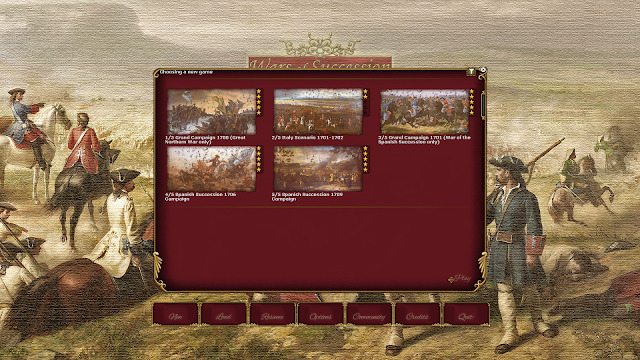 Ageod wargames have the ability to make gamers swear by them, or some to swear at them. I for one have never understood the latter. Ageod puts out obscure games that many others wouldn't touch. I like the engine and have never really had an issue with their games. Many people say that the AGE engine does its best work with wars earlier than the 20th century. I do not know if I would agree with that statement, but I have read many write ups praising this game, and I am in complete agreement with them. 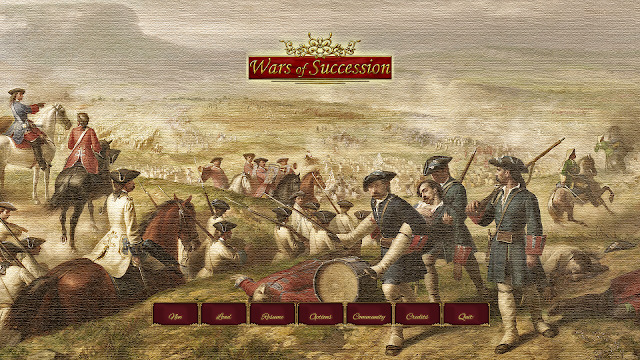 We can finally play not only the 'Great Northern War', but also the 'War of The Spanish Succession' on the computer, and as a bonus all in one game. The Italy scenario acts in some ways as the tutorial scenario, but only because of it's small size. So there really isn't a tutorial to play. Although to be honest the AGE engine has been around for a good long time, and there are plenty of YT videos and writes up about how to play Ageod's games. Warfare, in this age and later, was much different than the late 20th century. Many more soldiers died of disease than in action with the enemy. Straggling and just plain running away from armies was rampant, even though if caught the punishments inflicted were draconian. If there is one thing that this game can teach you about 18th century warfare it is that your army, even if you are successful, can melt like an April snow storm. As the old adage goes, 'professional soldiers study logistics, amateurs study tactics'. It doesn't make a bit of difference if you have the greatest plan in your head for an offensive if you arrive at your destination with 1/2 of your army wasted from the ravages of dysentery. An old joke between American Civil War soldiers was 'how are you?' the answer was invariably 'passing well'. The weather in this game also plays a crucial part, as it should. In the 1709 campaign in Russia, birds died in the air mid-flight from freezing. You could also ice skate from Germany to Sweden across the Baltic. The world suffered from the 'Little Ice Age' from the 16th to 19th centuries. The game's scenarios do not play or seem like they were cut out by a cookie cutter, meaning that it actually feels like you are commanding an army and nation in this age. This is not a nation builder simulation, so do not confuse it with Ageod's 'Pride of Nations'. This is meat and potatoes for a wargamer and the AGE engine; even if it is long in the tooth, it still gives the wargamer a great experience. The map is beautiful, and fits right in with the previous Ageod maps. The game turns are thirty days, and the form of the game is WEGO. This is where both sides command their forces to move etc. for the next turn, and then both sides move simultaneously. This means that each side does not have a clue of what the other is planning. You may attempt to attack your opponent, and then find he has moved in another direction. This means that this game has a very high 'fog of war'. The icons or pictures of the various commanders are very well done. I have to knock the game for one thing. The 'Wild Geese' (Irish Fleeing English Rule), and the Swiss are not in their red uniforms. The AI is good enough to keep you on your toes, and if you find the game much easier than some of us, the AGE engine has a ton of preferences to be changed to make it more of a challenge. The above shows the situation as it was in early 1709. The French had constructed a system of defense called 'Ne Plus Ultra' (literally 'no further'). The French nation was also on its last legs. They had been fighting wars for almost all of the last forty years. Crop failures and losses had meant that this was actually the last army they had to put in the field versus Marlborough. Marlborough determined to take the city of Mons. This set the stage for the greatest battle of the War of The Spanish Succession Malplaquet. Marlborough won the field, but at such a cost that Villars was able to report to Louis XIV "If it please God to give your Majesty's enemies another such victory they are ruined". The story of the campaign of Poltava in Russia where Charles XII finally faced defeat is just as thrilling. The above screen shows the results after a battle. I am an unrepentant Ageod fan boy. I have every game that is in the long line of antecedents of this one. I still enjoy playing them, and this new beauty is one of the best as far as myself and many others are concerned. Have to agree. 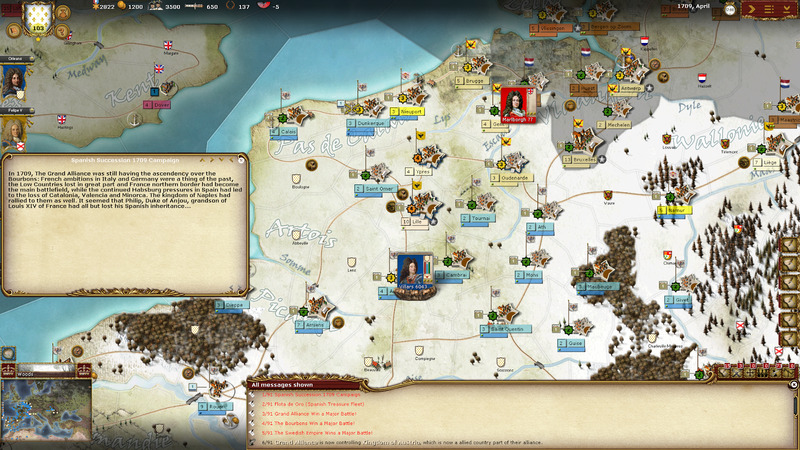 Espana and English Civil War were way too small, unless you were student of these engagements. This one reminds me of my favorite - the Revolution Under Siege monster scenario - but not quite that large!